How do I even begin trying to write about Afghanistan? Well, when I was nine years old, the Twin Towers fell. Nine years old was a hard age to deal with something of that magnitude because I was just old enough to be told what was going on, but not quite old enough to understand it. It was an unprecedented event and no one knew how to react. I remember the morning of September 11th, 2001 well because my 4th grade class was interrupted by a school administrator, who announced to us what had happened. The rest of the day was kind of a blur. I think I remember walking by the school library with a bunch of faculty members crowded worriedly around a television. It was there that I saw a plane crash into one of the buildings. I was the only student in my classroom who had ever been inside the Twin Towers and was thus subjected to the questions of my fellow peers – a very scary experience for me. Parents picked up their children early from school. I was picked up at the normal time, but by both of my parents – an unusual occurrence. My father was never one to withhold information from me and so when I asked “Why did this happen?”, I found myself overwhelmed by information about Osama bin Laden, Al-Qaeda, the Soviet Union, the Taliban, and a place I had never heard of: Afghanistan. Later that year, the United States went to war – a war that has lasted twelve years and counting. As a nine year old, when I heard that we went to war, it made me feel safe: There would be no more planes flying into towers. The adults (the politicians, the soldiers) would take care of the problem and my country would go back to being the peaceful, safe place I had always thought it to be. But, as time passed and the war dragged on, I realized that the problem wasn’t being solved. By the time I was a teenager, I began to wonder if we were possibly creating more problems than we were solving. By the time I reached my twenties, I became exasperated with it all: I was tired of my country being at war for well over half of my life. I was frustrated with our leaders for not fixing these problems and for the generation before me for not demanding that they solve them. I was frustrated with the education system, which did not give my generation the background information for us to solve the problems ourselves. Needless to say, in all my years of secondary school education, Afghanistan was hardly ever mentioned. I was not taught where Afghanistan was located on a world map, what its capital was, the reasons why we went to war, and the history of Soviet invasion in the Cold War. This was all information I had to learn on my own. Based on these thoughts and experiences, I had a very negative view of Afghanistan in my mind; and I was very worried that this would affect the book I would chose to read about the country. Subsequently, I decided that I would read many books about this country to give me as wide an understanding as possible. The first book I read is a book which I picked up at a used book sale benefiting the local library. I picked it because, firstly, it was only $1 and it looked as if it had never even been opened. Secondly, it seemed like the lightest read I could find about Afghanistan and still learn something worthwhile – an introduction into the country that would make me want to learn more. The book was entitled Come Back to Afghanistan: A California Teenager’s Story. During the summer months, Hyder Akbar would join his father and assist him in these various positions (his native English ability proving very helpful in the process), experiencing the Afghan political environment firsthand. 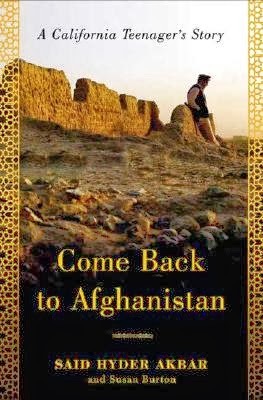 These were his first instances ever visiting Afghanistan, and subsequently, he approaches the country not as someone returning “home.” Instead, his voice is that of both a foreigner who finds himself befuddled by certain customs, but also as someone with a deep emotional attachment to Afghanistan. This book is filled with interesting tidbits and is perfect for someone wanting a gradual and interesting introduction to Afghanistan. Another instance discussed at length in the book is the death of Abdul Wali, an Afghan man who turned himself in willingly for interrogation (a strong indication that he was probably innocent) and ended up dying in US custody due to violent interrogation tactics. The interrogator, “David A. Passaro, a thirty-eight-year-old CIA contractor from North Carolina, [was] arrested in connection with Abdul Wali’s death” (page 260) and is serving a sentence of 8 years and 4 months in jail. The author’s father, who was the governor of Kunar, the region where this occurred, noted that the death severely affected the legitimacy of the U.S. troops, as well as the new Afghan government. Like the quote in the ending paragraph. And I am always interested in the conflicts among different religious groups in that area, such as Afghanistan and Pakistan. Hopefully next time you can write more about Afghanistan and develop a new perspective in that sense.